As a mother of a few, I have revered in a generous share of childrens' birthday parties anticipated here. Of a birthday child wistfully counting down the days. Of reassurances that the eager young one's special day will come—our toddler awaiting his birthday in June, but wanting it to be his turn in December. Of dreaming and making our celebrations earlier than need be—placing our eager, anticipated energy into making and readying for our handmade home birthdays. above, the birthday girl puts the magical touch on top of her homemade fairy cupcakes. So, I put them together. We are sharing our handmade birthdays in you make do™ party play kits™. These books kits are filled with party decorations—from our own party celebrations—you and your children cut out and make. And, I have also created a you make do™ paper play kit™ filled with playthings too. 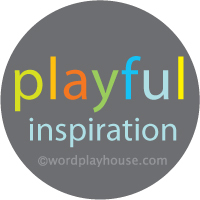 Because if there is one thing I have shared most on wordplayhouse® —It is play. Unstructured, wildly creative play. Enjoy the joy of handmade making with your own children; or share the gift of creativity with others by giving our paper play kits as thoughtful, unique gifts. Today we celebrate, not another birthday, but the culmination of thought and inventiveness poured into our paper play creations. We are so happy to finally share our playful work with you here today. We hope you will share our cheer too. This wondrous party kit is filled with imaginative, easy-to-assemble decorations. Create a playful and magical celebration day, to make it a remember-for-always one. Book kit includes: 12 dainty fairy cupcake toppers, 42 pretty blossoms to make a garland, 12 flower straw toppers, and a template to make blossom fairy wands and necklaces. All for a sweet celebration your special guests will remember with wondrous awe. Share in the marvel of play with our growing treasury of paper play books. Cherish them all. 40 pages. Paperback. 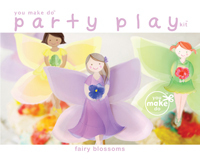 Image gallery of party play kit: fairy blossoms contents. Click images to enlarge. Available in book format, or as an instant download printable pdf file. This you make do™ paper play kit™ is brimming with creative playthings to cut out and make, create, build, and imagine for a wondrously playful learning day. Hours of paper play, to make days of imaginative pretend play. Share in the marvel of play with our growing treasury of paper play books. Cherish them all. sail away make-and-play set™ includes: 6 sails and sailboat flags to make sailboats, sailors, fish, whale, pelican, seagull, crab, starfish, nautical flag chart to roll up and bring on imaginary sailing adventures or to frame and hang, sailor knot chart, 12 banner flags to make a garland, and instructions to make a dock for play. 40 pages. Paperback. 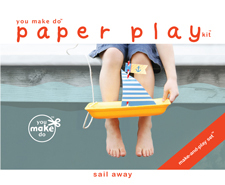 Image gallery of paper play kit: sail away contents. Click images to enlarge. Book kit includes: 12 whimsical bug cupcake toppers, 18 reversible garland flags, 12 striped drinking straw toppers, and 12 bug treat bag toppers. All for a sweet celebration your special guests will remember with wondrous awe. Image gallery of party play kit: whimsical bugs contents. Click images to enlarge.